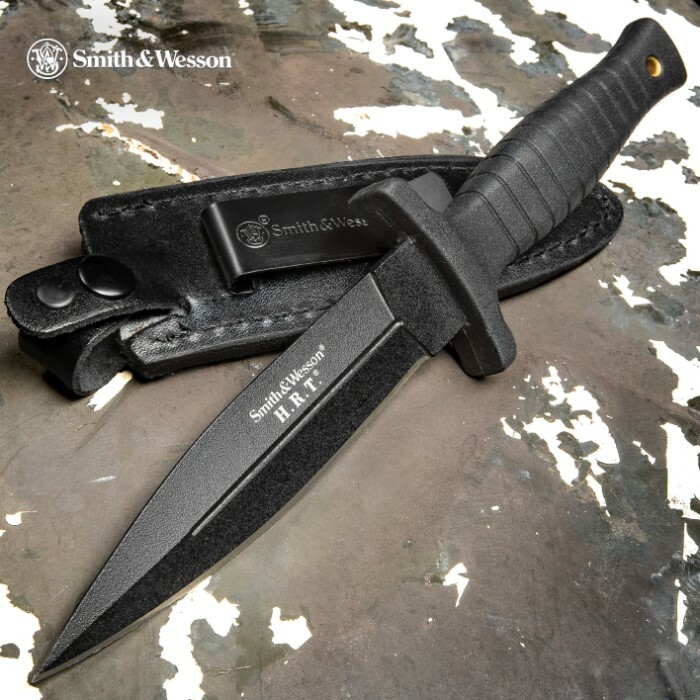 Smith & Wesson HRT Tactical Boot Knife | BUDK.com - Knives & Swords At The Lowest Prices! The Smith & Wesson tactical boot knife is an HRT Hostage Rescue Team blade. 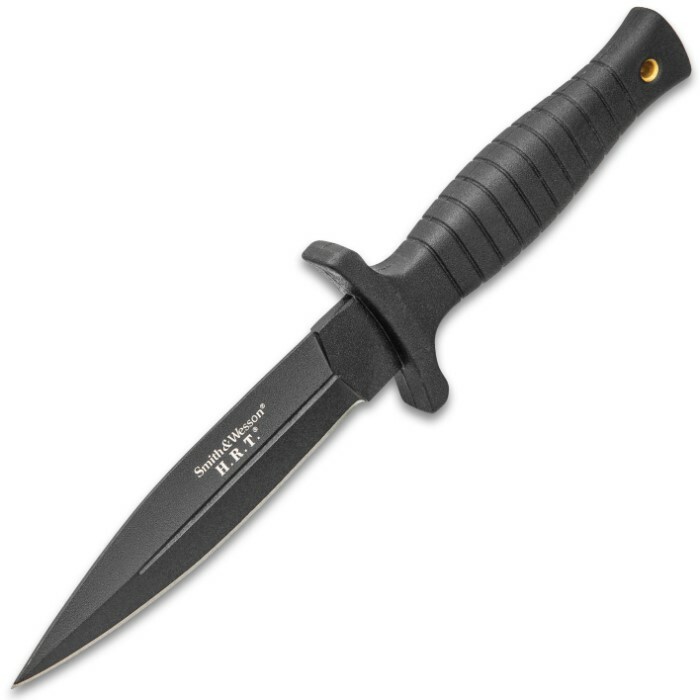 This fixed blade knife has a 440C stainless steel dagger blade with an all black tactical coat. 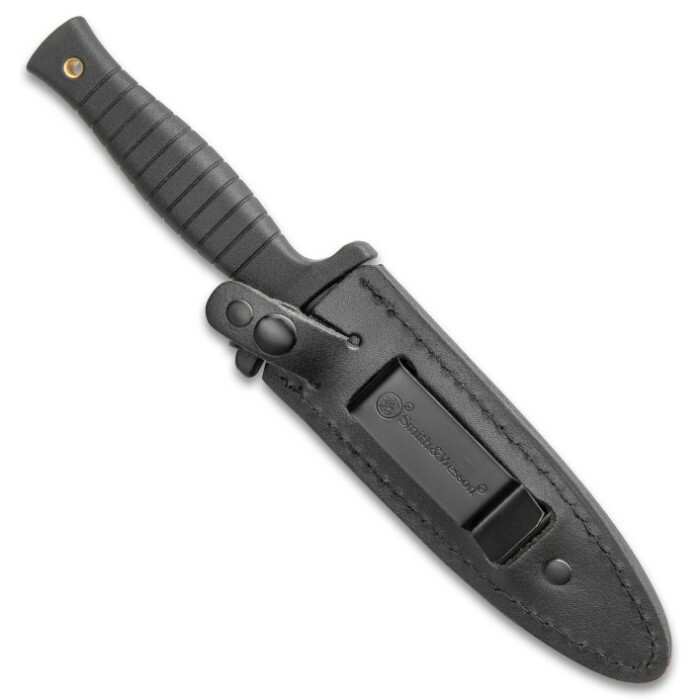 The knife also comes with a leather boot sheath with a retaining strap that snaps closed. 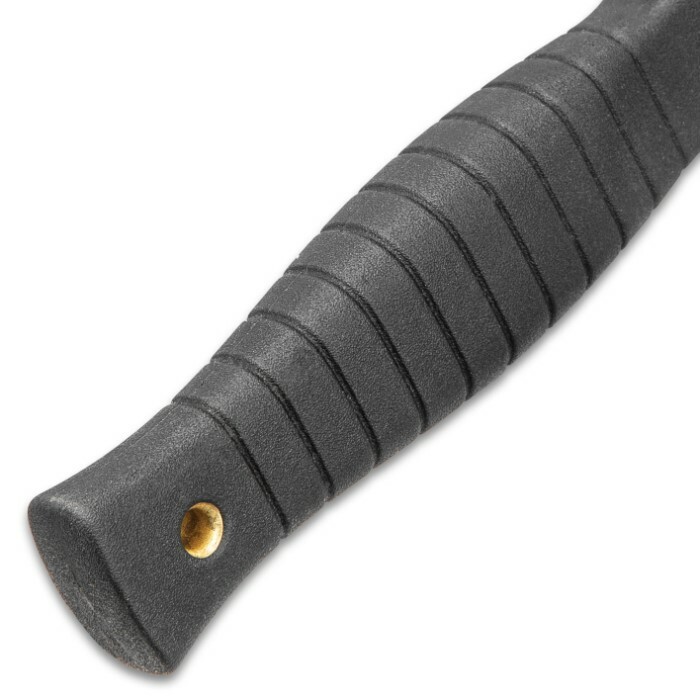 Slightly disappointed, " boot clip" is located too low on the sheath. 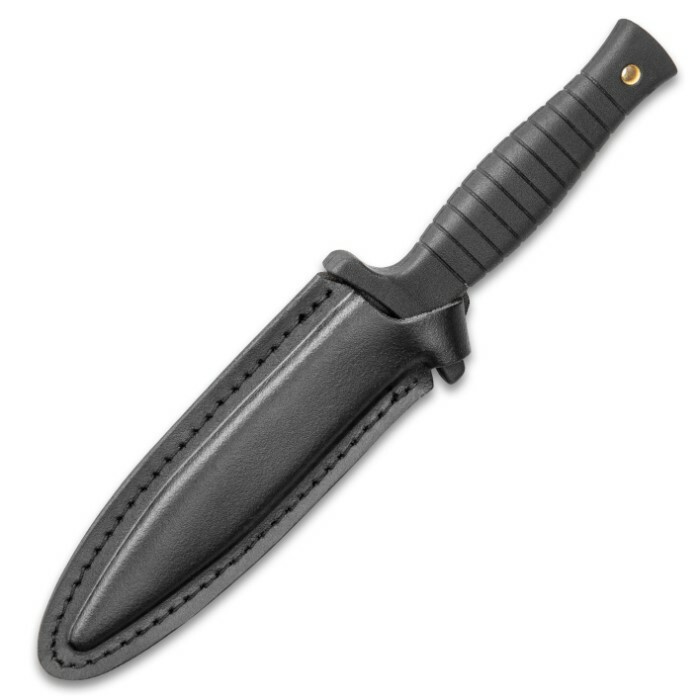 Knife itself is excellent, Just sticks out of the top of my boot too far.I would have to pull my pant leg over my knee to get the knife out of the sheath. Just right for clipping inside my boot.Not as sharp as I'd have liked but adequate. The handle design is right for quick retrieval in case of self defense circumstances. This is a very good knife, it has a very good feel and the balance is very good. Only one side is sharp, but that does not make it any less than a great knife. 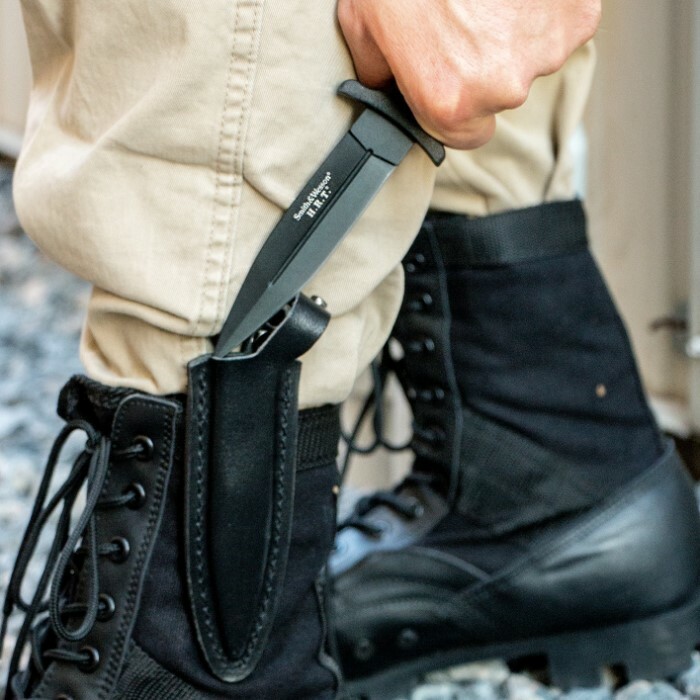 This is only my third boot knife, but it's by far the best. It came with a decent edge, but was easy to sharpen. The sheath is high quality and the knife fits snugly. You don't even need the clip to keep it inside. This is one of smith and wesson's greater knives. The knife lived up to the S&W name. Handle is both rigid and comfortable. The knife holds a fine edge and I have sharpened both sides. Worth the money. Absolutely love this knife. Picked it up from Cabela's today and it is amazing. First off, it is not double edged even though it looks that way, which is a plus because it makes it legal in wider selection of states. Plus it's full tang. It says on the package that it's made of 7cr13mov high carbon steel but says 440c on here? The leather sheath is great! Only problem is that it is a little tight at first(it loosens with use. Highly recommend this knife to everyone! Don't hesitate, hit add to cart NOW!!! i bought this knife thinking that since it was 20$ it wasn't going to be that good, but since its S&W i gave it a shot. this is the best knife you can get for 20$ new and the knife is well balanced and razor sharp. it looks as good as it is and makes a great throwing knife too. i have not had to sharpen it yet even after a month of using. great knife, highly recommend it. When I purchased I thought it was double edge, it was not. and when you put the knife in the sheath it dulls the blade because of how tight it is. but it is a good quality knife. I love this knife. I have had many boot knives and this is my favorite. Perfect size weight and grip. Sure the coating will wear off but that just goes with using it. The best thing going for it other that it being a great brand name and made to S & W's quality is the sheath. Perfect boot sheath and great clip. I'm thinking of buying another just for the future.